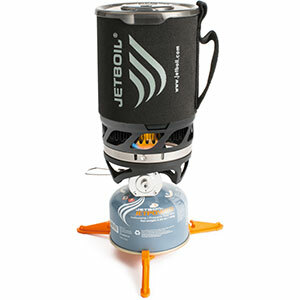 This is a lower cost alternative to the JetBoil stove. 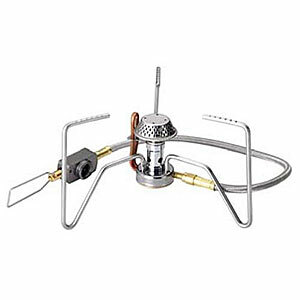 This is a lower cost alternative to the JetBoil stove. It has the same setup, good efficiency, and saves you enough money to buy a bunch of fuel canisters. When packed with the gas canister inside, it can be a little noisy. Any small soft item fits in and silences it. 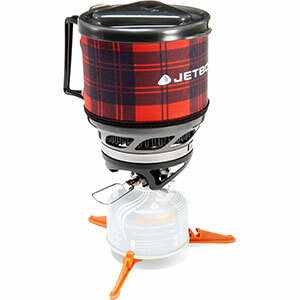 I kept on bouncing back and forth between buying a JetBoil or an MSR Windburner. 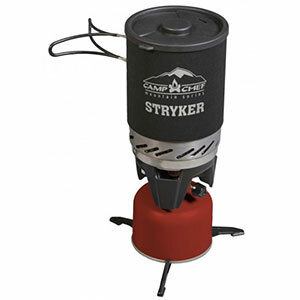 I had finally decided to pick up the MSR when this stove showed up in a Google search. I spent some time researching it and couldn't find any negative comments. Mostly positive, and about $40 cheaper, so I figured I'd roll the dice. I'm glad I did. 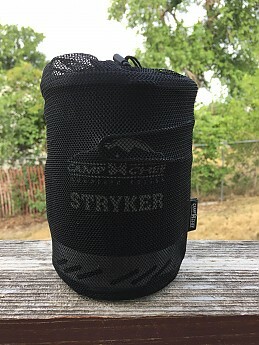 I'm sure I would have been happy with the MSR (I have an MSR PocketRocket that I love), but I haven't had a problem with the Stryker and it was significantly less expensive. By necessity, I have had to learn how to squeeze the most value out of every dollar I spend, so while I often buy the high-dollar, high-quality items, I will press my luck now and again. It doesn't always work, but it did this time. The stove setup is straightforward. 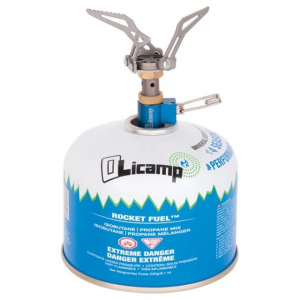 It has a snap-on stabilizer that fits on the gas canister and provides more stability. It has the burner, the pot (with handles and neoprene cover), and a lid. The gas canister nestles inside the pot along with everything else for space conservation. It fits a little on the loose side, but I put my micro-towel in there and problem solved. The Piezo ignitor works fine and the flame starts on the first try every time. It boiled 16 oz of water in 2 minutes and 37 seconds (this was my best time — all times that I monitored were below 3 minutes). There are baffles around the bottom of the pot that protect the flame from the wind. One item to note though is that when I turn the stove full open, it sometimes seems like the flame sputters a little. I turn it down a tiny bit and it burns true and hot. 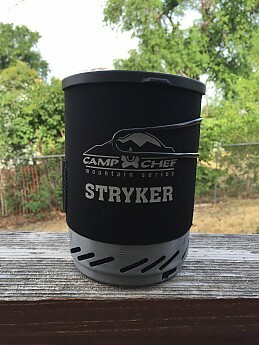 I haven't cooked food in this yet because I mostly do freezer bag cooking on the trail. The flame is adjustable so I have no concerns about it running too hot if I was cooking in it. I could have spent the extra money on the bigger name, but I have not been the least bit disappointed with this stove and I have no concerns about it failing on the trail. Thanks for the review, ilmbaba. I wasn't aware of this stove from Camp Chef. Do you have any pictures of yours you'd be willing to show in your review? Hi Alicia. I uploaded some pictures of the stove system. Looks good! Thanks for sharing those for others to see, ilmbaba. 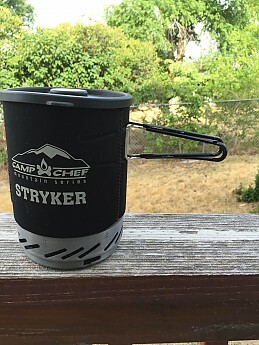 I admit that before I saw your review I didn't realize Camp Chef had any smaller backpacking stoves like this. 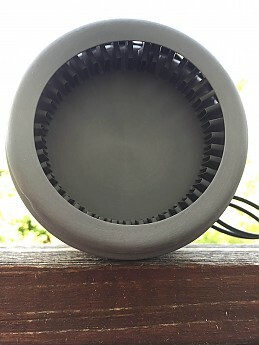 I reviewed the Windburner as a review corps assignment and noted that a piezo igniter would be a good idea because it's difficult to light in the wind, which is supposed to be its strong suit. I'd be curious to see how the piezo igniter holds up after extended use. You might also check the boil time to see how that compares with the competition since fuel efficiency is supposed to be another advantage. 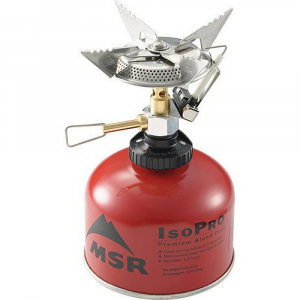 And MSR has come out with a 1.8 L pot and a frying pan for the Windburner -- any larger pots for this stove? I don't see much use for the frying pan, but I'll be using the 1.8 L on an 11-day hike with my wife this summer where we will need the extra volume. There is an adapter you can buy. Best price I found was around $15.87 with shipping from Campfire Meals. Other sites had the item cheaper but charged $10.00 for shipping. I hadn't ordered one but after reading BigRed's post, I went ahead and got one. Thanks for the review. It's an interesting product. I was surprised to learn the pot it comes with is 1.3 liter. It's larger than Jetboil competition and large enough for me to completely cover cooking for two people without having a second pot. They also make a 2 liter pot and a frying pan that can be used on the same burner with an adapter and they are definitely killing the competition prices. The only drawback so far is the product seems to be relatively new and is not stocked by the majority of the dealers. I'll be watching the market for better availability to buy it. 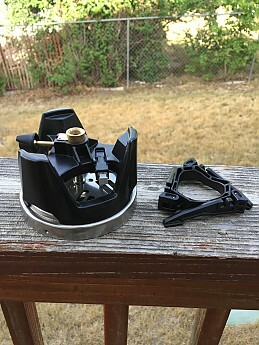 Well, I used this stove extensively during my two weeks camping during elk season. It has performed flawlessly, The only thing that isn't perfect is it tends to not want to let go of the pot when you seat it securely. Not a bad trait so your pot doesn't fall off, but a little annoying when trying to get the contents out. I had taken to just pouring while the pot was still attached to the base (with flame off, of course). That seems to have worked out OK. This is a quality product at a budget price. It has a built-in starter and weight wise it is light and user friendly. Setup is easy and with the built-in lighter it fires right up. Flame control is pretty good, but simmering is not the greatest. 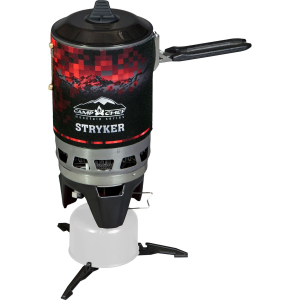 Its strength is heating water, if you purchase the simmer plate it gives you more control over just using the flame. The stove is pretty good in the wind and boil time for 1 or 2 cups of water is about 2.5 minutes with excellent fuel efficiency. Darn, my spouse was even impressed with this stove and that is saying something. This product is fairly new to us but our "real world" use so far is great! We have camped, car camped, hiked and have found this to be one of our best purchases. Quality product that performs like a champ. Welcome to Trailspace, Jeff! Thanks for the review. I hope you'll keep us posted on on your stove.